A veiled chiton blending in amongst coralline red algae and other red seaweeds in the low intertidal. The anterior end with the extended girdle is pointing down in this image. Photo by Sara Wickham, with identification assistance from Andrew McCurdy. The veiled chiton gets its name from the front portion of its girdle, which is elongated into a flap-like extension that is noticeable wider than the rest of the girdle (at least 1.5 times the width). This extension is often lighter in colour than the rest of the girdle. Many thick hairs dot the girdle. The shell plates are usually mottled or streaked with multiple colours. Olive green is almost always one of the girdle colours; other common colours are brown, pink, and blue. This chiton gets to 6 cm long. Search the species name in CalPhotos for more images. 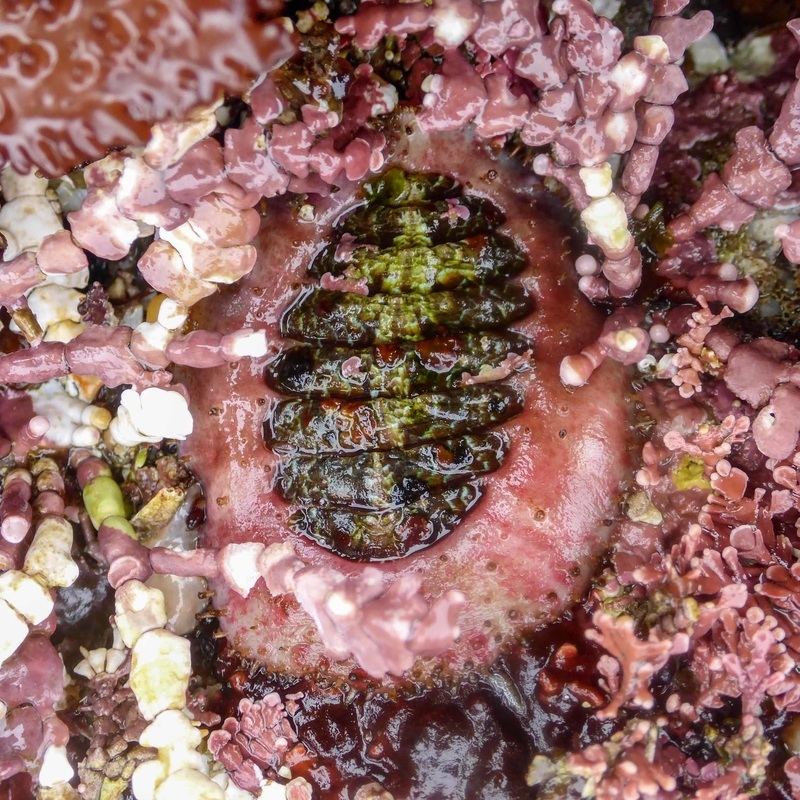 This chiton is found in current-exposed habitats with rock or cobble bottoms, and in depressions formed by the purple sea urchin (Strongylocentrotus purpuratus) along open coast. It tends to be associated with coralline red algae. It inhabits the intertidal and subtidal to 20 m deep. Its range extends from Prince William Sound, Alaska, to central Baja California, Mexico, though it is less common north of Vancouver Island, BC. The red-veiled chiton (Placiphorella rufa) usually has orange or red plates with white or brown mottling but no olive green. The long, thin girdle hairs are sparse and usually limited to the front edge of the girdle extension. The girdle is often white. As with other veiled chitons, P. velata is a carnivore. It feeds by raising its girdle extension, or "veil", and pinning any unwitting prey that wanders beneath, such as small crustaceans and even tiny fish. See this feeding technique in the video below. Baldwin, A. Illustrated Keys to the chitons (Polyplacophora). In Invertebrates of the Salish Sea. Rosario Beach Marine Laboratory. Accessed 04/07/2016. Baldwin, A. (2007). Placiphorella velata (Veiled Chiton). In Klinkenberg, Brian. (Ed.) E-Fauna BC: Electronic Atlas of the Fauna of British Columbia. Lab for Advanced Spatial Analysis, Department of Geography, University of British Columbia, Vancouver. Accessed 04/07/2016. Cowles, D. (2004). Placiphorella velata Carpenter in Dall, 1879. Invertebrates of the Salish Sea. Rosario Beach Marine Laboratory. Accessed 04/07/2016. Harbo, R. M. (1997) Shells & Shellfish of the Pacific Northwest. Madeira Park, BC: Harbour Publishing. P. 231.